The offer of FLUKE measuring equipment available at TME has been enriched with new portable 4-channel 190 scopometers of II series. Models of part numbers FLK-190-204 and FLK-190-104 operating in 200MHz and 100MHz range respectively are now available. 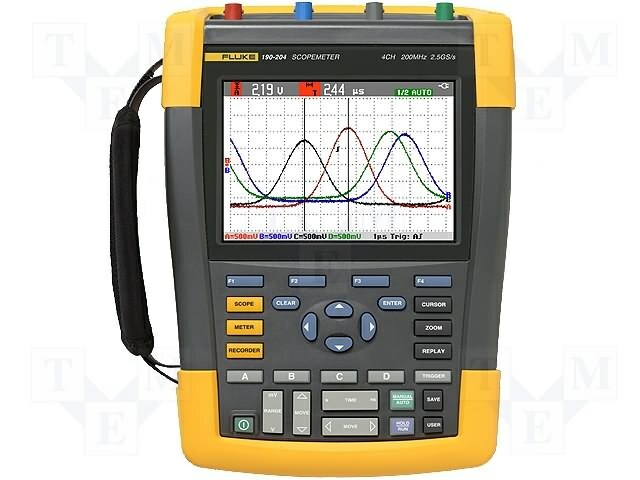 FLUKE 190 II series scopometers are first 4-channel portable devices of this kind compliant with CAT III 1000V/CAT IV 600V. Sampling rate of up to 2.5GS/s, single shot, pulse width and video triggering, 10,000 samples per channel memory to zoom in on the waveform details, isolated USB ports for memory devices and PC connectivity, 7-hour battery life with Li-ion technology - these are only some of the features of new 4-channel FLUKE scopometers. Rugged and shock-proof body, the highest safety standards with the performance of lab oscilloscope allow very wide range of measurements - from microelectronics to power electronics devices. Built for harsh environments of dirt, dust and industrial dangerous conditions - 190 series II are perfect devices for engineers and plant maintenance technicians.